i like the symmetry in the first shot, Ray. i am no ornithology expert but i believe i have seen plenty of sunbirds in Singapore. Ray: Indeed, Ayush...the Singapore air is 'aflutter with Sunbirds, and I have seen them there myself. Terrific shots, Ray! Just love these! This is hardly the angle that birds are shown. This is just incredible. Fabulous pictures. I agree with Astrid...the angle totally makes these images for me, Ray. Ray: The bird was hovering...I was directly behind it...I thought it presented an unusual opportunity, Ginnie. Quelles jolies photos, j'adore ! Superbe ces prises de vues..pas facile à capter si le mouvement est constant ..
Ray: Merci, Claudine. L'oiseau planait, donc la majeure partie de son corps était immobile et j'ai utilisé une vitesse d'obturation rapide pour essayer d'arrêter la plupart du mouvement de l'aile. Very nice too, a nice spot o' nectar for breakfast..
Ray: Yes...I often have a healthy dollop of honey on my breakfast toast. Exceptionally well caught, Ray, in view of the number of wing-beats per sec! Ray: I managed to achieve about 1/640sec shutter, Lisl, and that helped. The bird was eating while hovering, and this mean't its body was reasonably still. 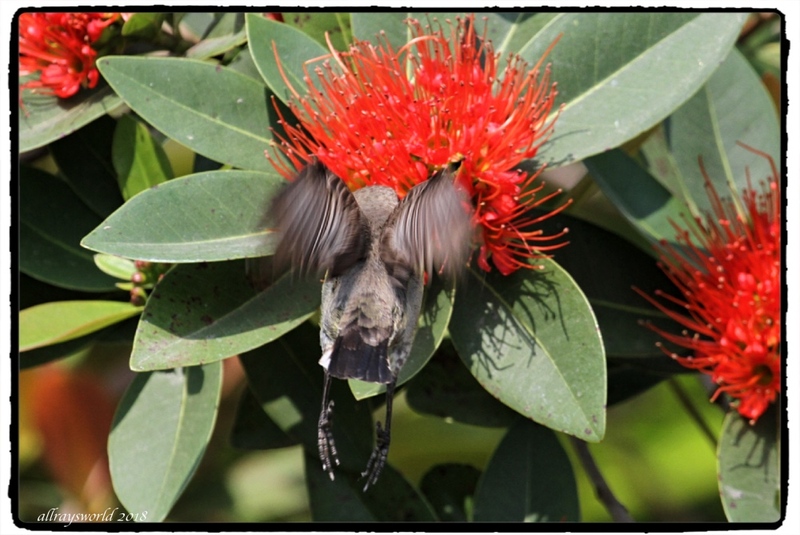 There is a marked similarity with the humming birds I have seen in the US. What a cracking shot of the rear end of the bird on its final approach. Ray: Not on final approach, Alan...actually feeding whilst hovering. I am trying to imagine a dinner party where we could hover and eat with just our mouths. Could be a bit messy I think. Ray: Once you have mastered the hovering, Chad, the rest of the party trick is quite straight forward. Ray: Sure can, Bill...when they remove their shoes! I cannot agree with the word "very small" - fascinating images again! But...what is the problem with the words "very small"? Very cool views. I especially like the second. Ray: It is astonishing the find the amount of wing movement required to achieve hovering. I've always thought Hummingbirds are very clever the way they are designed to feed like this. Ray: Hummingbirds and Sunbirds seem to be quite successful species, Brian...their design must be good.